Congressmen, staff and the public saw a new face for plasmas - important basic science, multiscale phenomena from the lab to the universe, a large number of applications, and cutting edge technology for the 21st century. 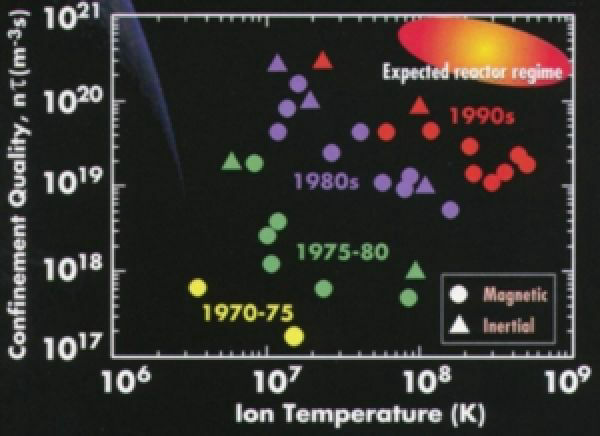 Plasma temperatures and densities range from relatively cool and tenuous (like aurora) to very hot and dense (like the central core of a star). 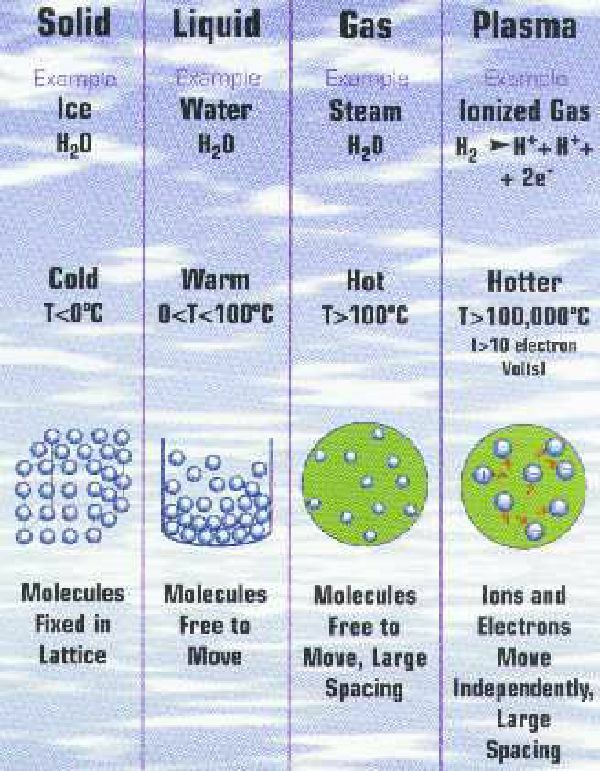 Ordinary solids, liquids, and gases are both electrically neutral and too cool or dense to be in a plasma state. The word "PLASMA" was first applied to ionized gas by Dr. Irving Langmuir, an American chemist and physicist, in 1929. The vast power radiated by our sun is generated by the fusion process wherein light atoms combine with an accompanying release of energy. In nature, proper conditions for fusion occur only in the interior of stars. Researchers are attempting to produce the conditions that will permit fusion to take place on earth. The United Nations projects an increasing population and increasing energy demands. 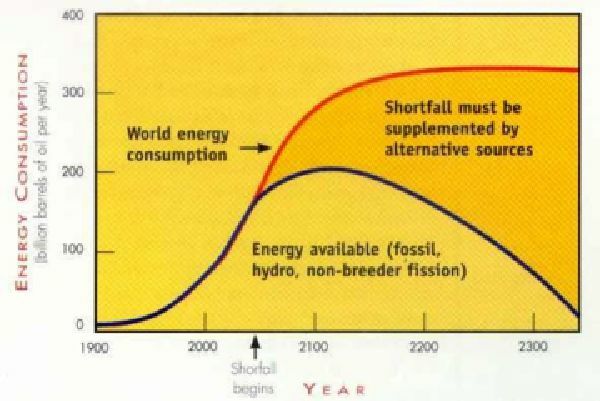 In order to meet future needs, long-term sustainable energy sources are required. Ideally future energy sources will comprise a mix of energy technologies - solar, renewables, advanced nuclear fission and fusion. 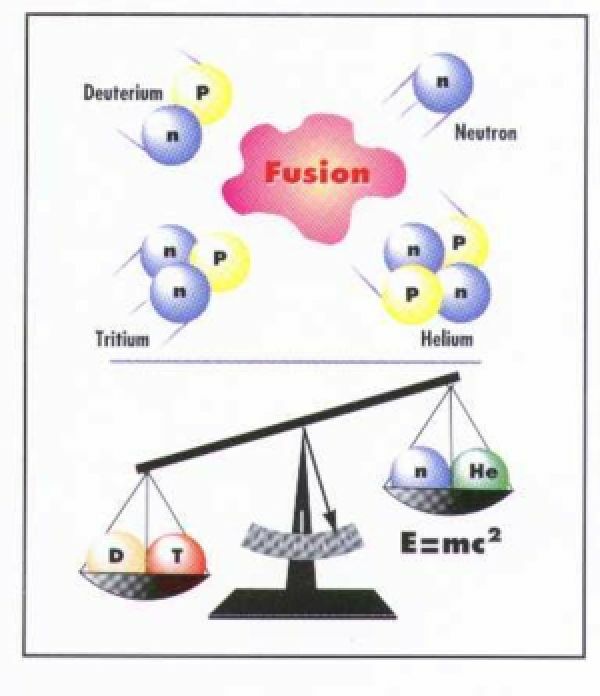 Fusion requires energetic collisions of very light elements, usually hydrogen isotopes, resulting in a nuclear reaction that leads to more stable helium nuclei and other byproducts. A net loss of mass results, yielding free energy as given by Einstein's famous equation. 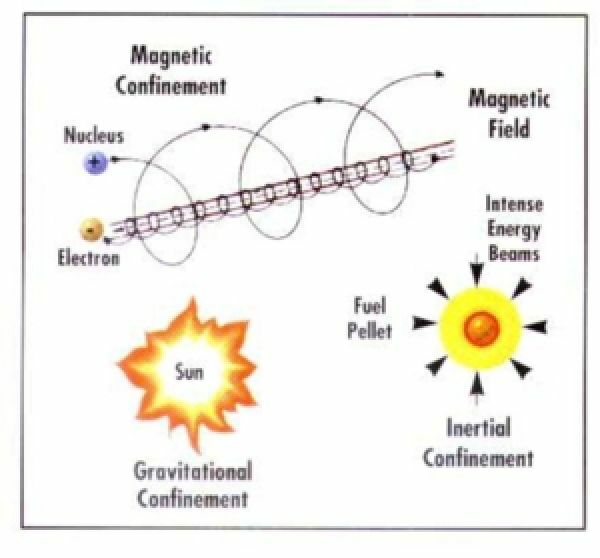 There are three basic confinement mechanisms required for fusion reactions: gravitational, inertial, and magnetic. 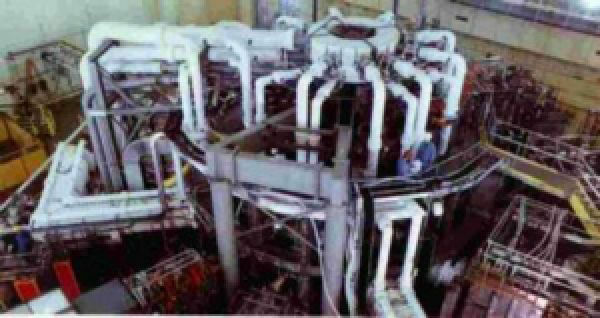 The Tokamak Fusion Test Reactor (TFTR) at Princeton (below) uses magnetic confinement. 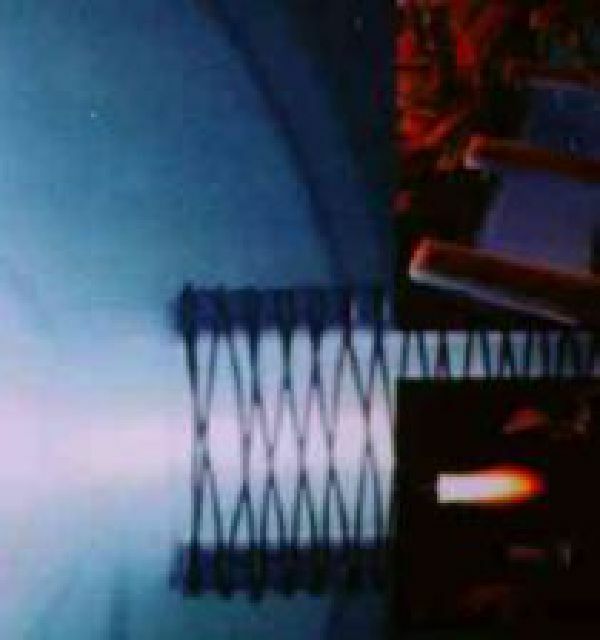 Plasma radiation within the Princeton Tokamak during operation. 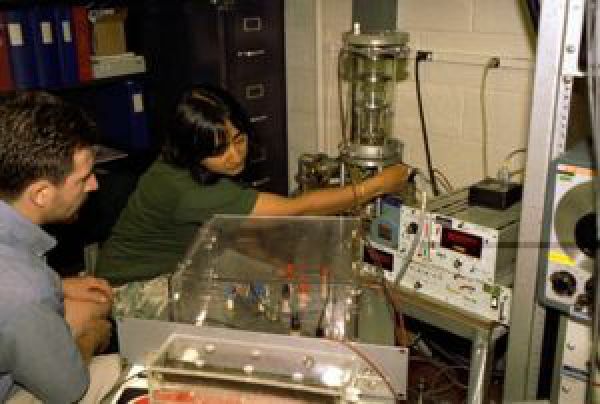 Laser plasma interaction during inertial confinement fusion test at the University of Rochester. Graphics for this section courtesy of the Massachusetts Institute of Technology. Iron filings injected into a plasma release atoms that become excited and emit light which can be readily analyzed. An atomic metal emissions monitor can be positioned within a smokestack where it could detect hazardous emissions in real time. Plasma-based sources can emit intense beams of UV & X ray radiation or electron beams for a variety of environmental applications. For water sterilization, intense UV emission disables the DNA of microorganisms in the water which then cannot replicate. There is no effect on taste or smell of the water and the technique only takes about 12 seconds. This plasma-based UV method is effective against all water-born bacteria and viruses. Intense UV water purification systems are especially relevant to the needs of developing countries because they can be made simple to use and have low maintenance, high throughput and low cost. Plasma-based UV water treatment systems use about 20,000 times less energy than boiling water! 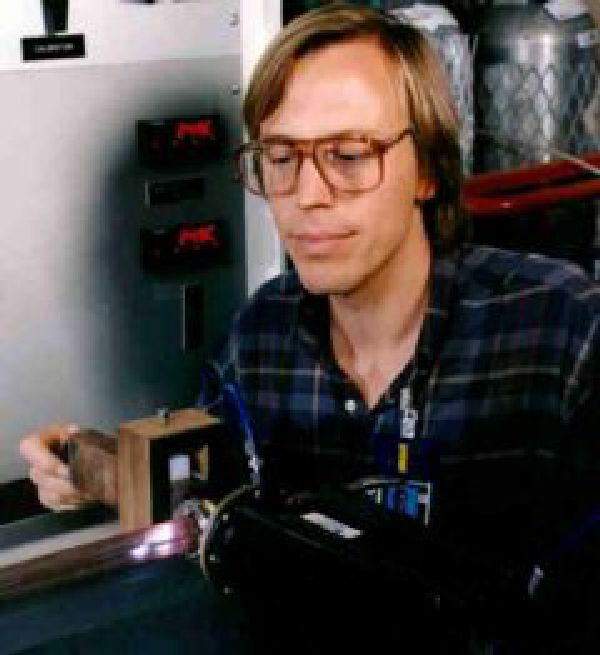 A plasma device being developed produces hydrogen-rich gas from diesel fuel, gasoline, methane and other hydrogen-rich fuels; provides cleaner burning fuels for conventional engines; works with fuel cells for higher efficiency and reduced pollution; and dramatically reduces environmentally toxic substances in the products of combustion. 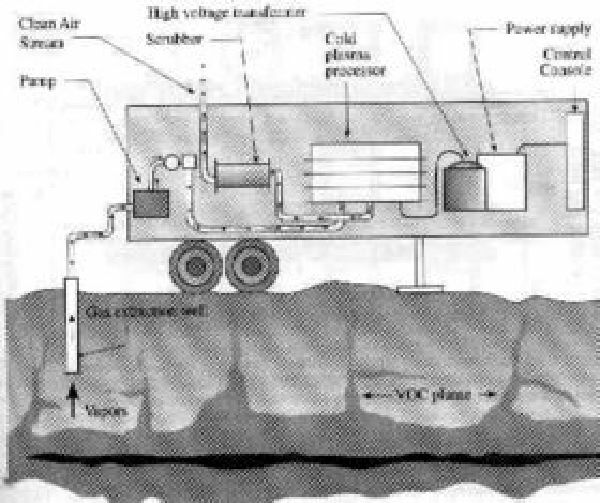 Pollution Monitoring: Exhaust gas flow from a furnace passes through a microwave plasma, becomes excited and emits light which is analyzed by a spectrometer to identify any hazardous elements. Electron-beam generated plasma reactors can clean up hazardous chemical waste or enable soil remediation. Such systems are highly efficient and reasonably portable, can treat very low concentrations of toxic substances, and can treat a wide range of substances. 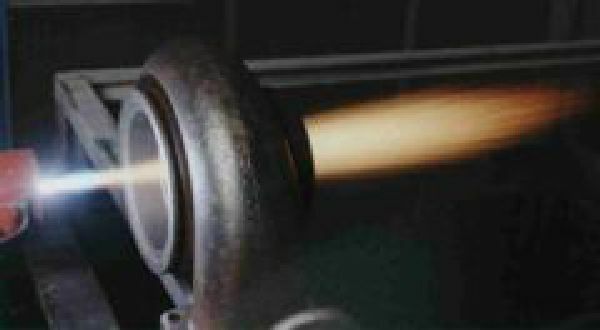 High-temperature plasmas in arc furnaces can convert, in principle, any combination of materials to a vitrified or glassy substance with separation of molten metal. 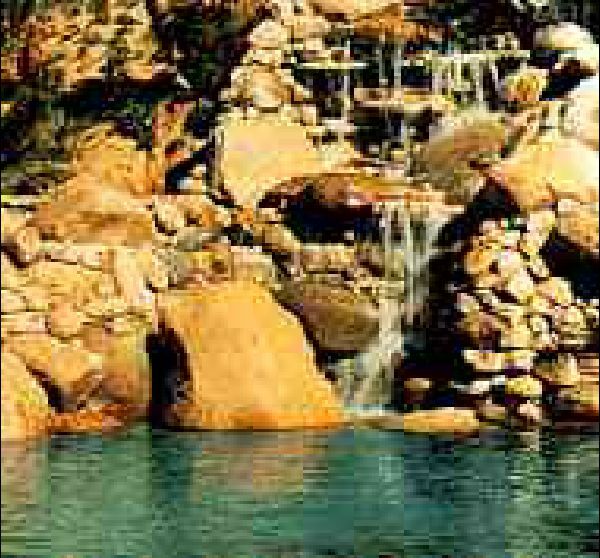 Substantial recycling is made possible with such furnaces and the highly stable, nonleachable, vitrified material can be used in landfills with essentially no environmental impact. Graphics for this page courtesy of the Los Alamos Scientific Laboratory. 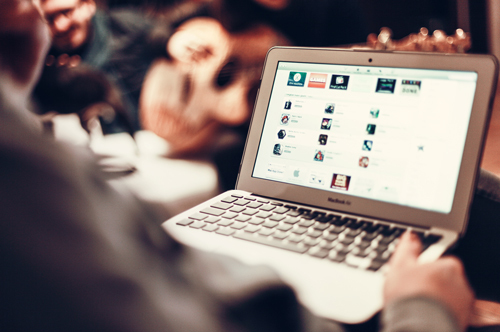 Plasma technologies are used by a wide variety of companies worldwide. Copyright 1999. Space Science Institute, Boulder, Colorado, all rights reserved. Many people believe the space in between the the Sun and its planets is empty, a vacuum devoid of energy or matter. But space is not empty. Our Sun constantly emits plasma, a superheated state of matter, which moves out in all directions at very high speeds to fill the entire solar system and beyond. By studying processes that occur in the earth's magnetosphere (where earth's magnetic field has a greater influence than the Sun's interplanetary field), in interplanetary space, and around other planets, we are better able to appreciate the important role of plasmas throughout our plasma universe. This space plasma laboratory is truly our window to the stars. The earth's magnetosphere is normally invisible because the dominant hydrogen and helium ions coming in the solar wind do not scatter light in visible wavelengths. 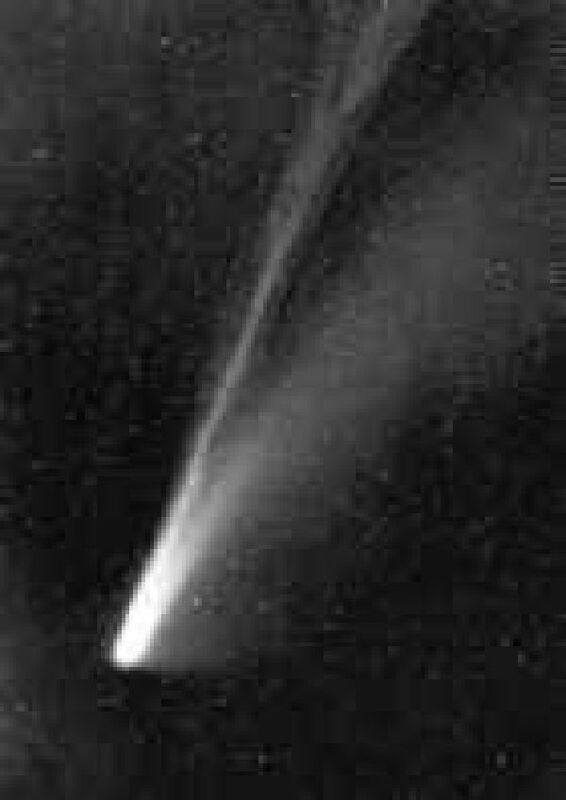 However, comets emit heavier ions that are visible and which result in spectacular neutral and ion (plasma) tails. 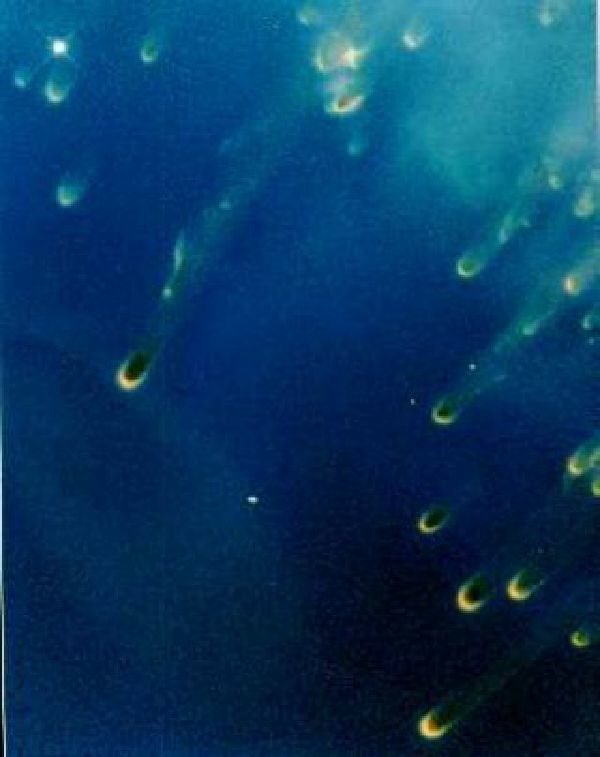 Images of earth's magnetosphere would show it to be a very large comet-like interaction region. 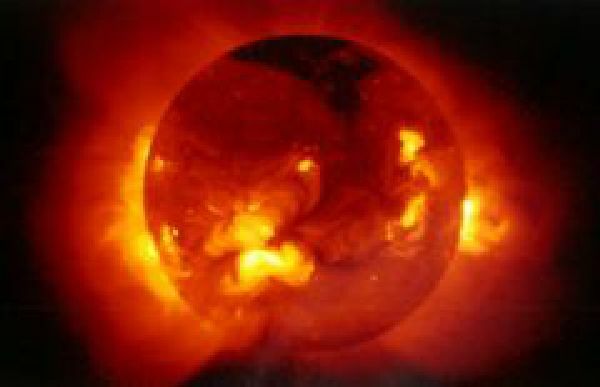 The Sun is a variable star, especially in its output of ultraviolet radiation, X-rays, particles and magnetic fields. Corresponding large variations occur throughout the region of the Sun's influence, which is called the heliosphere and which includes the solar wind and all solar system magnetospheres. 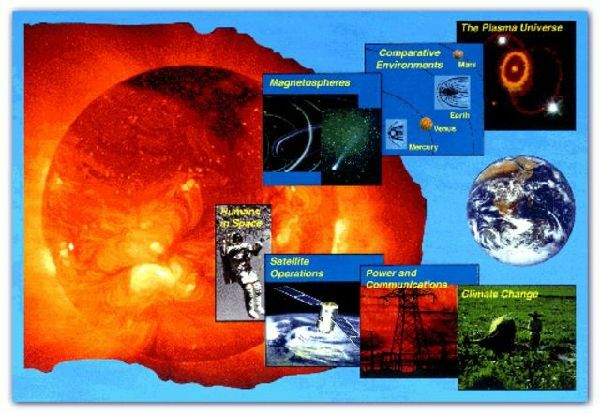 Space weather is the study of how the space environment affects astronauts, satellite operations, communication systems and ground-based power grids. In the long term, space weather could contribute to global climate change primarily through slow changes in solar radiation. As the solar wind flows past earth's magnetosphere, it interacts with the geomagnetic field and acts as a cosmic generator producing millions of amps of electric current. Some of this electric current flows into earth's upper atmosphere which lights up like a neon tube to create the beautiful aurora. The aurora are always present because the solar wind source is always present, and they form a ring of emissions within the ionosphere centered on both magnetic poles at high latitude. However, they are normally sub-visual except at nighttime and during geomagnetic storms. 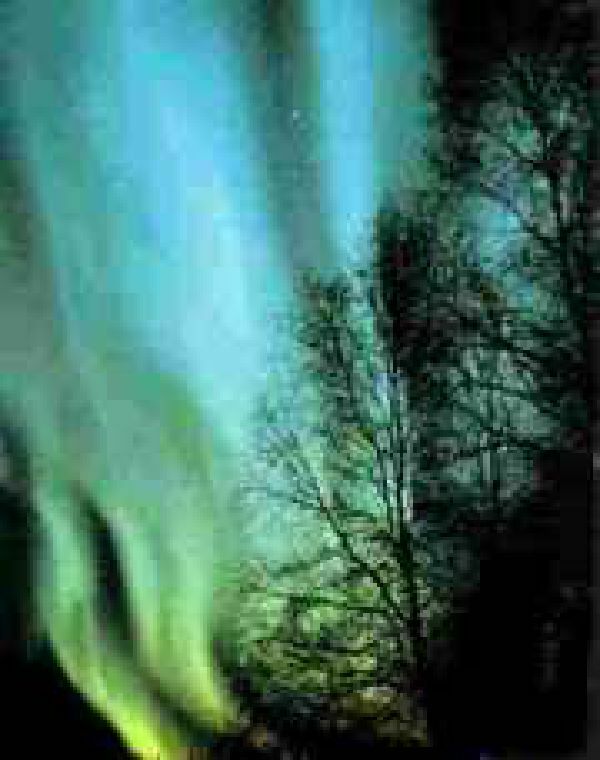 In midwinter, residents of Fairbanks, Alaska enjoy auroral display two out of every three nights! structures appear in light blue. 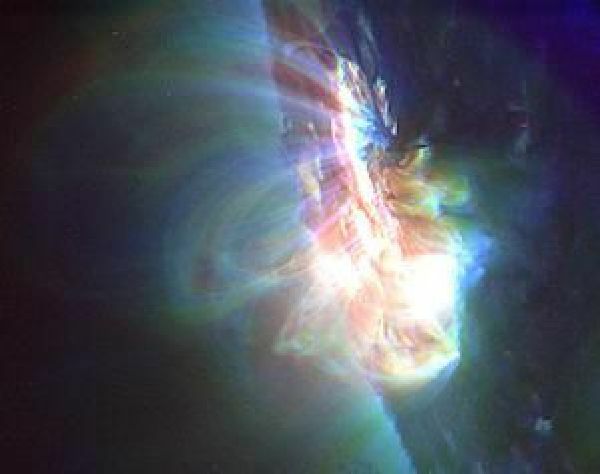 Plasmas pervade the heliosphere and local interstellar medium. The shape of the heliosphere results from a comet-like interaction with the surrounding plasma (from T. Eastman, IEEE Trans. Plasma Science, 18, 1990, p. 20). 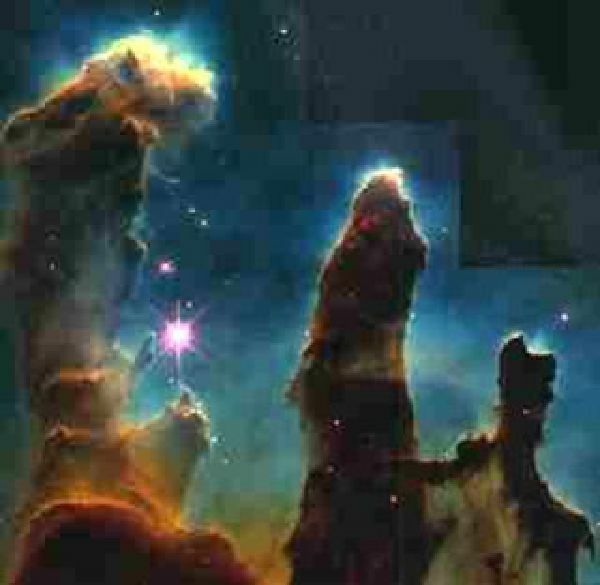 Intense regions of star birth are evident here near the boundaries of the dark pillars of the Eagle nebula. Electrodynamic effects of plasmas become important with only a few percent ionization as illustrated by earth's ionosphere. All visible regions here and most of the low-density regions in between are dominated by plasmas containing neutral particles, ions, electrons and electric and magnetic fields. 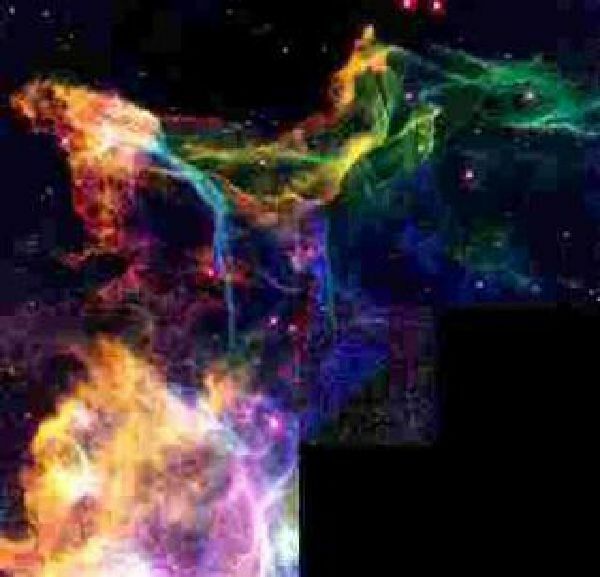 Within the dark columns plasmas might be present only within and near stars, with the surrounding gas in these columns being cold and neutralized. High energy density plasmas are often produced using pulsed power hardware. 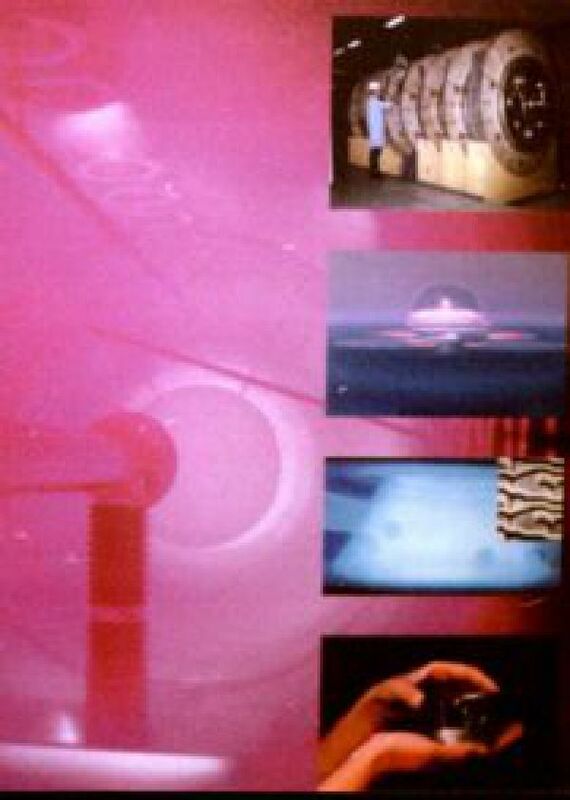 In operation, an eerie glow emerges from the Z machine at Sandia National Laboratories. 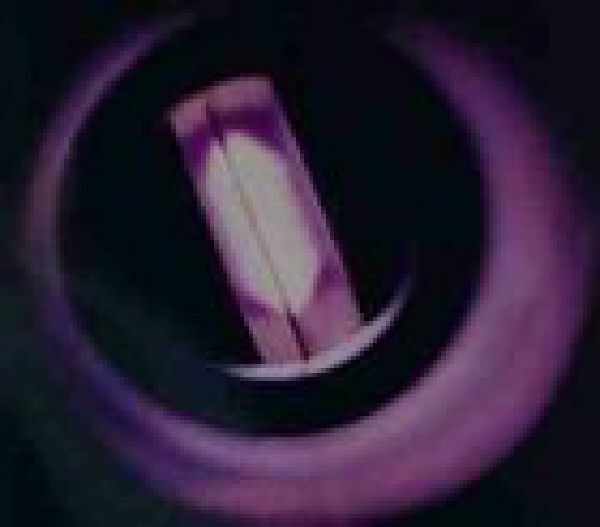 In inertial-confinement fusion, laser beams or ion beams energize the inside of a small cylindrical target. 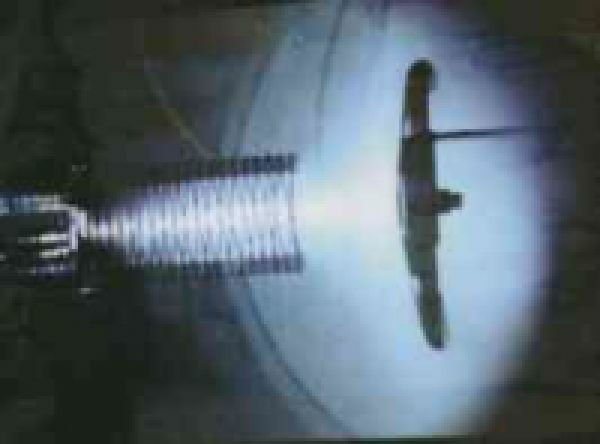 X rays then rapidly heat the capsule (1) causing its surface to blow off (2). 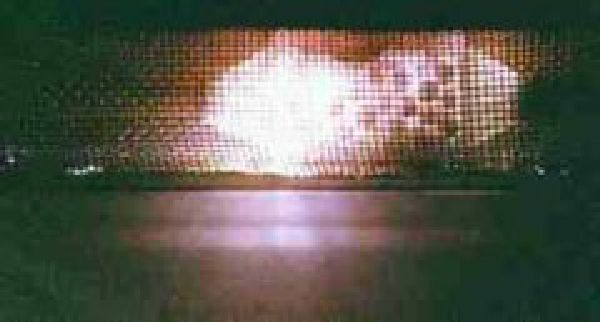 The resulting force compresses the plasma fuel (hydrogen isotopes), raising temperatures to 100,000,000 degrees C and densities to 20 times greater than lead. 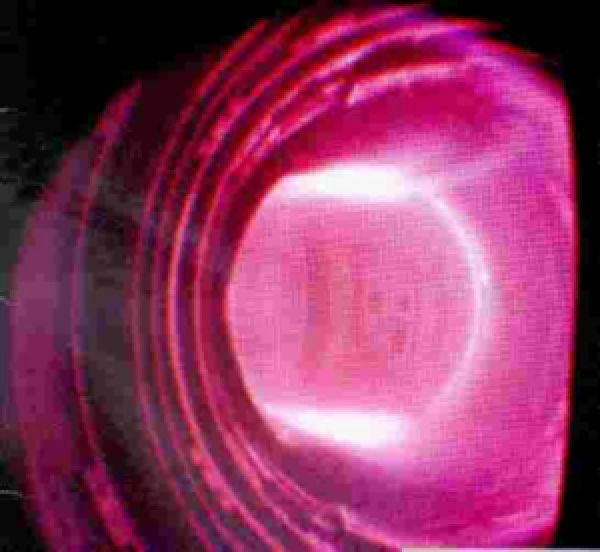 This ignites the plasma fuel (3) and produces fusion energy output (4) many times the laser energy input (thus yielding large energy gain). Plasma ion implantation can produce hardened surfaces for many defense and civilian applications. The National Ignition Facility is a key element in our nation's Stockpile Stewardship and Management Program which aims to maintain confidence in the safety and reliability of the U.S. nuclear weapons stockpile under a Comprehensive Test Ban Treaty. Target data from this facility will be used to verify complex computer simulations of nuclear weapons physics. 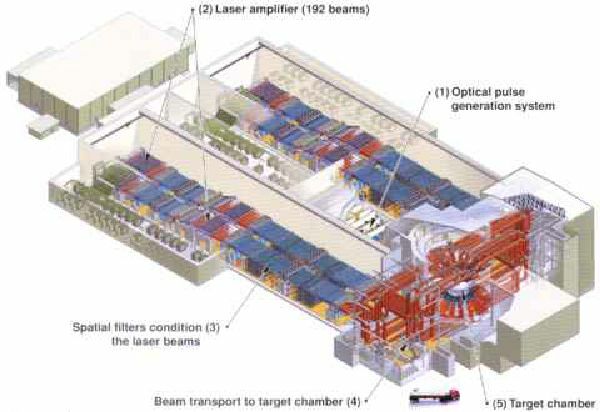 The National Ignition Facility will be used for research in inertial fusion energy and applications and help build a basis for realistic development of inertial fusion energy systems. All but first graphic and two lighting items in this section prepared by Oak Ridge National Laboratory. 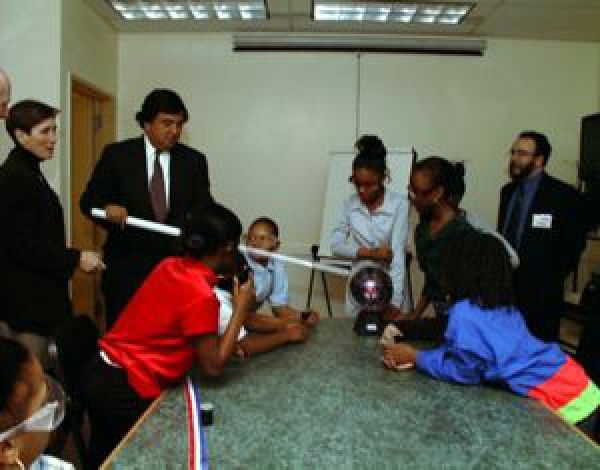 High efficiency lighting; manufacturing of semiconductors for home computers, TVs and electronics; flat-panel displays; and surface treatment of synthetic cloth for dye adhesion. 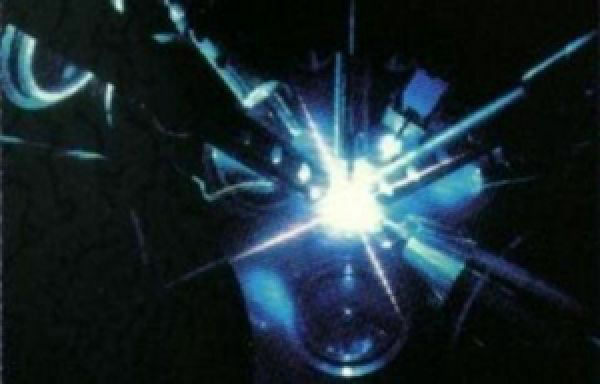 Plasma enhanced chemistry; surface cleaning; processing of plastics; gas treatment; spraying of materials; chemical analysis; high-efficiency lighting; semiconductor production for computers, TVs and electronics; and sterilization of medical tools. 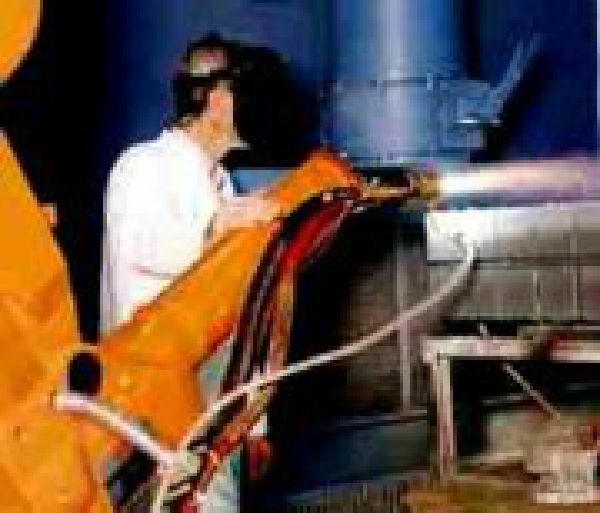 Plasma spraying of surface coatings for temperature and wear resistance, treatment of engine exhaust compounds, and ion thrusters for space flight. The most prevalent man-made plasmas on our planet are the plasmas in lamps. There are primarily two types of plasma-based light sources, fluorescent lamps and high-intensity arc lamps. Fluorescent lamps find widespread use in homes, industry and commercial settings. 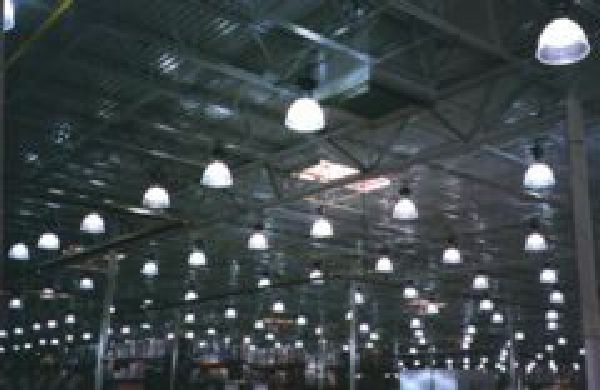 High-intensity sources are widely used in industrial and commercial settings as well as for outdoor and security lighting near homes and public areas. It is high-intensity arc lamps that give you the spectacular panoramic views of cities as you fly over them at night. 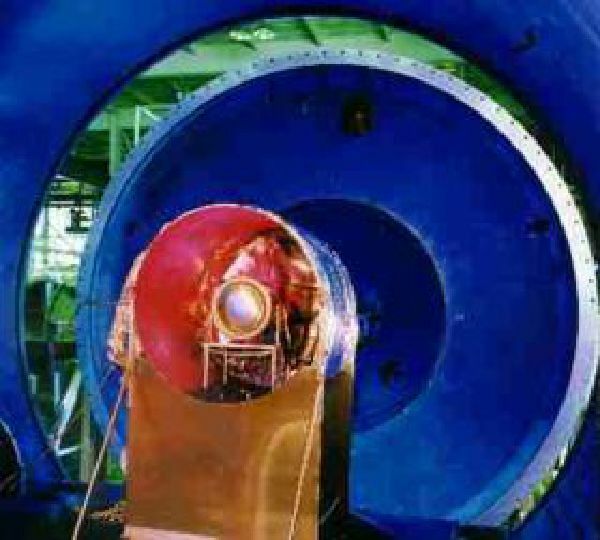 In high-intensity arc lamps the light we see is generally produced directly by the plasma. Color characteristics are controlled by the chemical elements put into the plasma rather than by a phosphor coating on the wall. 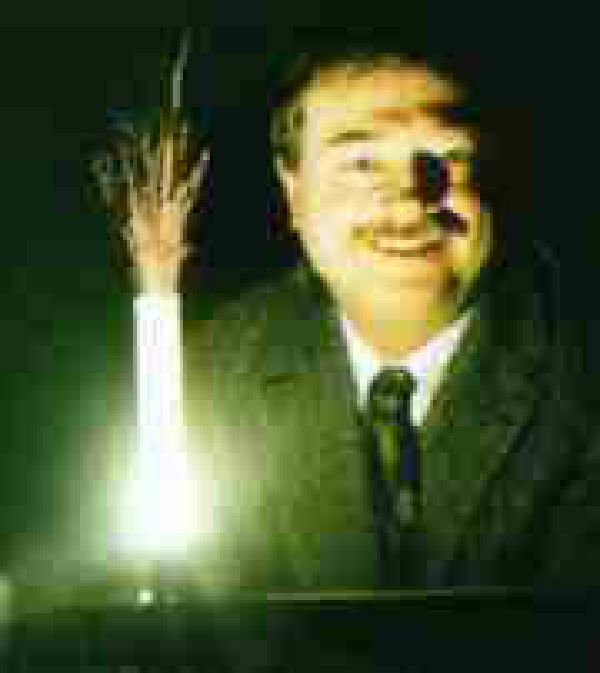 Inside every fluorescent lamp there lurks a plasma. It is the plasma that converts electrical power to a form that causes the lamp's phosphor coating to produce the light we see. The phosphor is the white coating on the lamp wall. 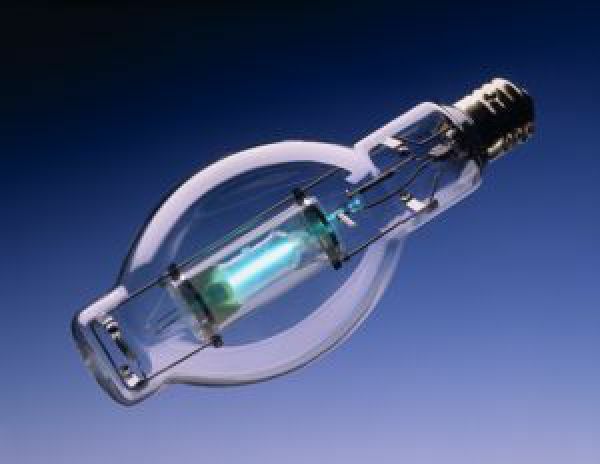 A fluorescent lamp is shown here with part of the phosphor coating removed to reveal the blue plasma glow inside. 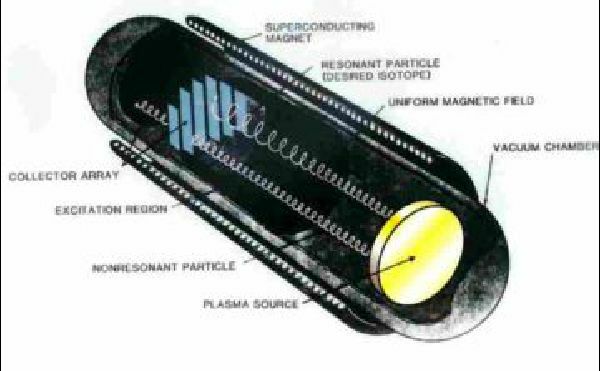 Plasma-based light sources are in fact observable from outer space. Indeed, it may be characteristics of the light from those lamps that tell an alien civilization of our presence. 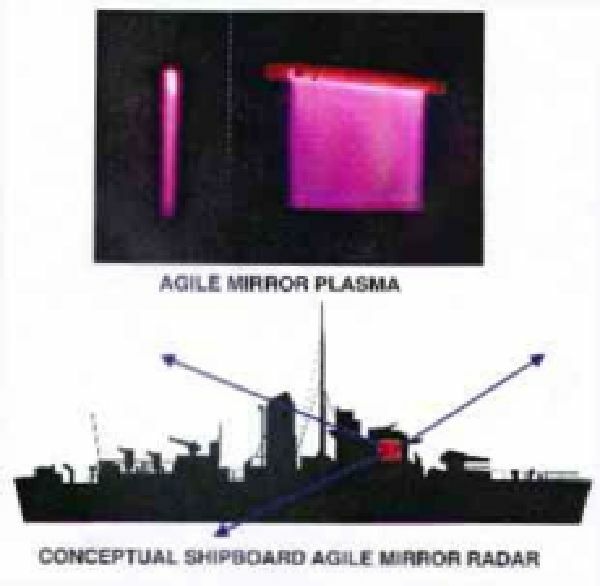 Plasma displays generally consist of two glass plates, each containing parallel electrodes, sealed to form an envelope filled with a neon and xenon gas mixture. 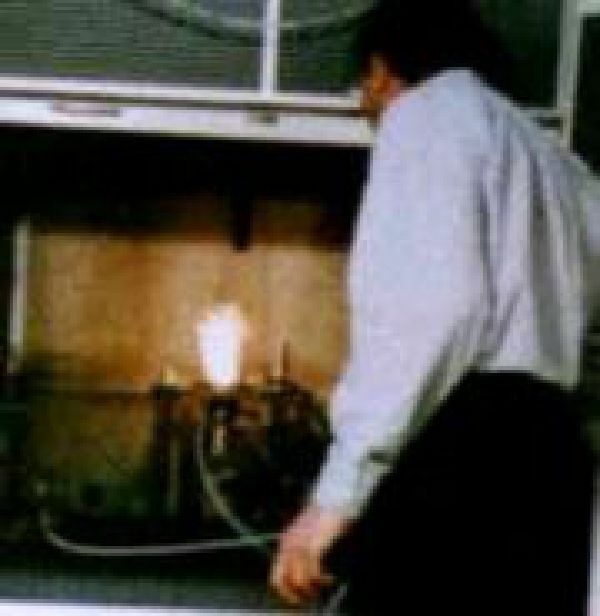 A gas discharge plasma is created by applying an electric field between the electrodes. Plasma sources and magnetic field control of gyrating charged plasma particles are important for the separation of stable isotopes for medical and industrial use. 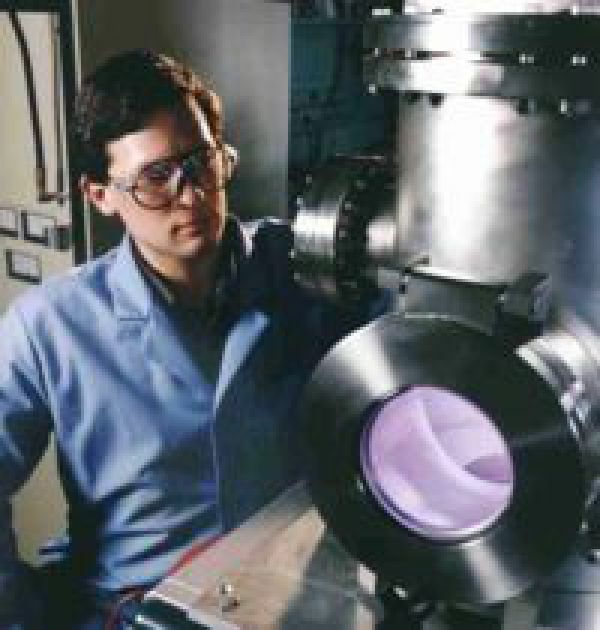 The plasma generates ultraviolet light which in turn excites the phosphor coating inside the glass envelope. The phosphor emits a single color of visible light. 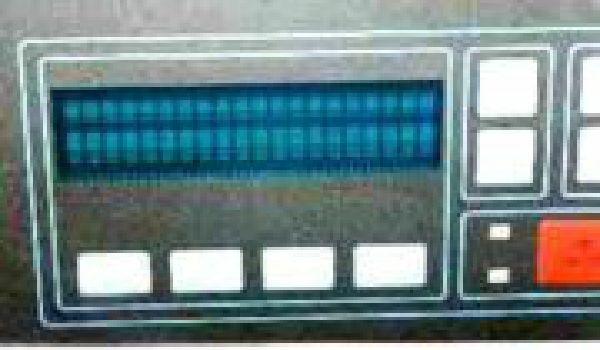 Each pixel consists of three sub-pixels, one each of red, green and blue. By combining these primary colors at varying intensities, all colors can be formed. New one-atmosphere plasma systems make possible new methods for surface cleaning and sterilization for food, medical, and other applications. Whereas standard heat sterilization is time consuming and irradiation can damage materials, this new plasma technology has been shown to kill bacteria on various surfaces in seconds to minutes. In addition to destroying bacteria, such plasma systems also destroy viruses, fungi and spores. These systems also provide an environmentally benign method for pre-treating surfaces. 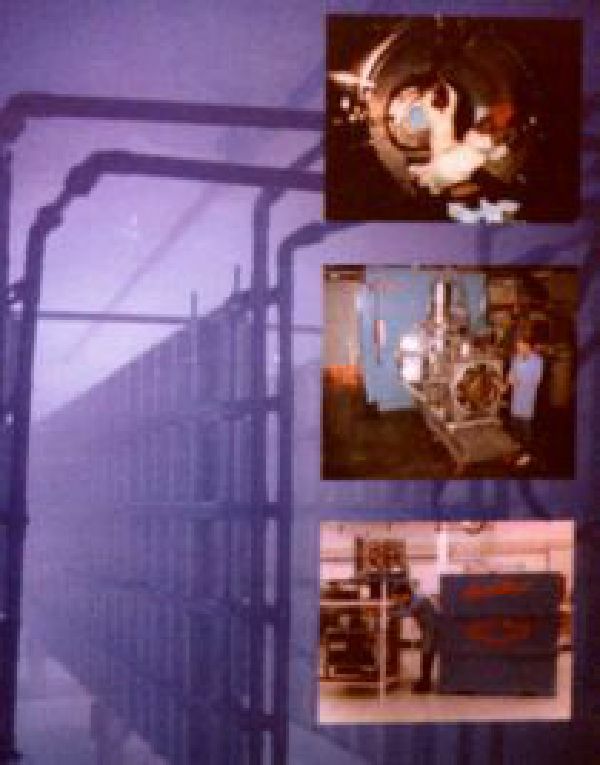 One-atmosphere plasma systems are now becoming available for various industrial applications. 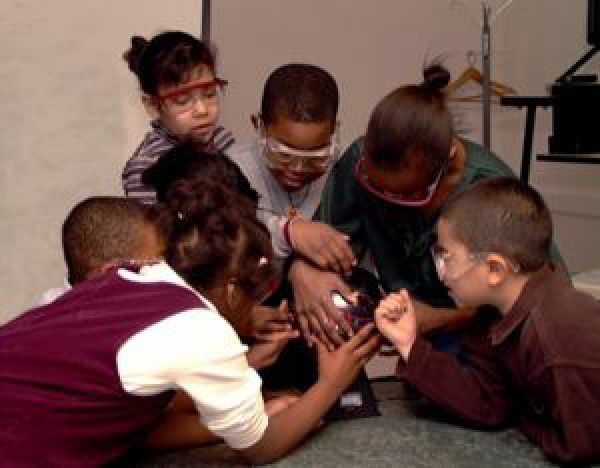 at all levels to develop the capabilities of America's future scientists, and to develop the science literacy and problem solving know how of all students. 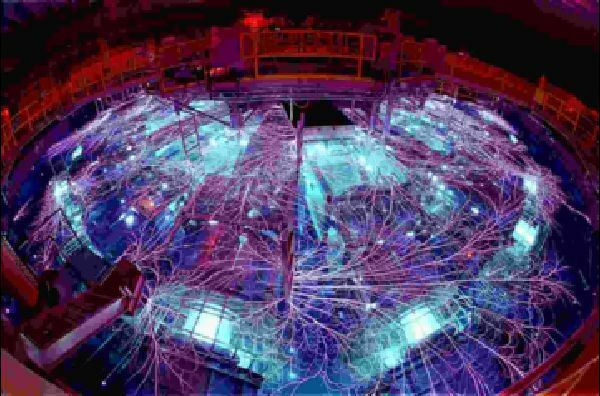 Plasma related experiments are excellent vehicles for illustrating and understanding complex physical concepts and for exploring cutting-edge topics in physics, materials sciences, computer sciences, and mathematics.